Make your unicorn or princess theme party come to life with the Unicorn Streamer Set. This 2-in-1 streamer set is perfect for adding color and shine to your decorations. Each package contains vibrant cutouts of unicorns, unicorn heads, and gold letters that spell out “Believe”. 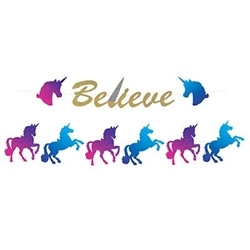 This streamer can be made to display all unicorns or you can spell out the phrase "Believe" and put a unicorn head on each side. Contains a total of (15) cardstock cutouts and (1) white ribbon. Simple assembly required.